The key is to leverage software to create new relationships between suppliers and consumers, not to necessarily become the next giant platform on the scale of Facebook or Android. With names like Android, iOS, and Facebook dominating today’s technological, cultural, and economic landscapes, it’s easy to see why so many business leaders are interested in turning their companies into platforms. But as we have written before, it is not obvious that becoming a platform is the right (or the only) strategy. Often, it pays to bootstrap your ecosystem success by connecting to other platforms, the way Airbnb did in its early days with Craigslist. It is easy to demonstrate these rules, elaborated below, by doing some simulations. For the simulation, assume that there are two digital ecosystems (1 and 2, in the below chart). Each attracts both suppliers (red), who offer products and services, and consumers (blue), who use those products and services. Because they reinforce one another, suppliers are attracted to consumers, and vice versa. 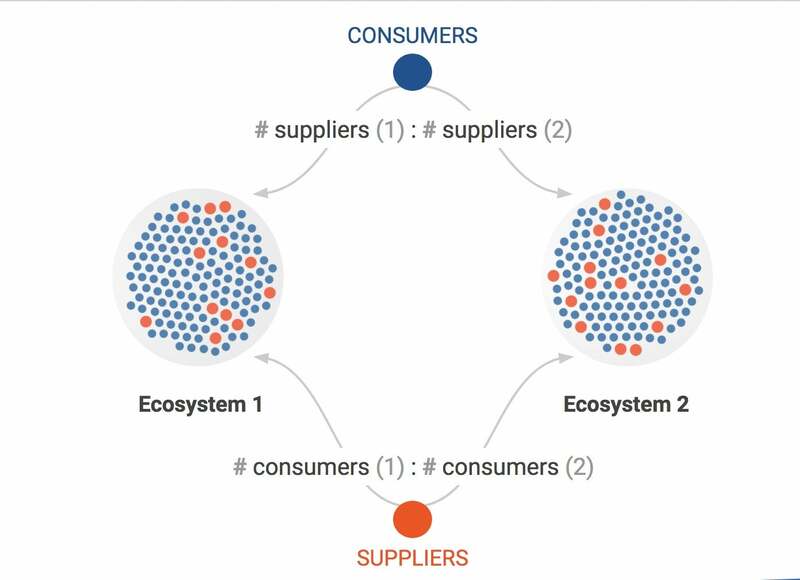 In this simulation, new consumers choose an ecosystem based on the ratio of #suppliers(1):#suppliers(2), meaning that as one ecosystem gains more suppliers, consumers become increasingly biased toward choosing it. You might imagine this as each consumer tossing a metaphorical coin weighted in this ratio. Suppliers choose similarly. The simulation is populated by 10,000 consumers for each supplier. We ran this simulation 10 million times, with one consumer and one supplier as a starting state. 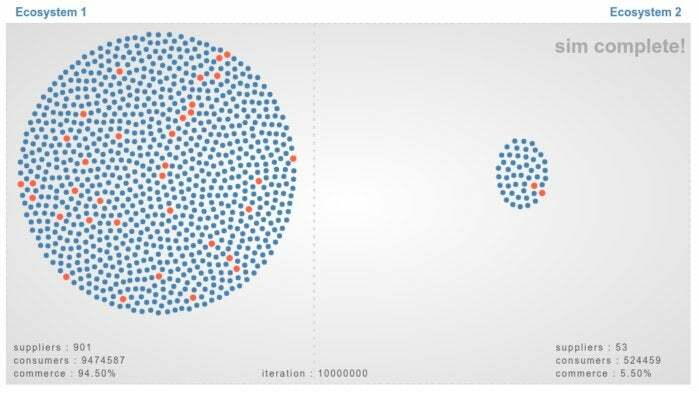 Somewhat counterintuitively, if the two ecosystems start at the same time, our simulations do not show each of them getting 50% of the market. Because of the randomness built into this exercise (the “coin tosses”), early advantages lead to sustained advantages. 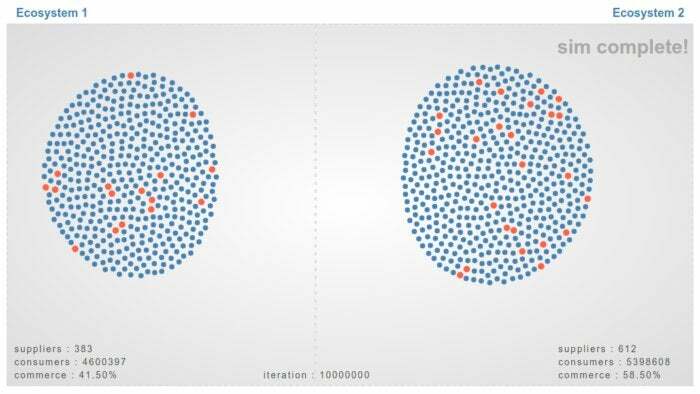 Sometimes the differences can be extreme; in our simulations, we’ve seen one ecosystem grow up to 2.5 times bigger than another ecosystem that launched at the same time. This, of course, mimics real life, with randomness of execution contributing to one side winning over the other. Let us illustrate this by changing the starting time of Ecosystem 2, delaying it by 100,000 iterations (1% of the simulation). 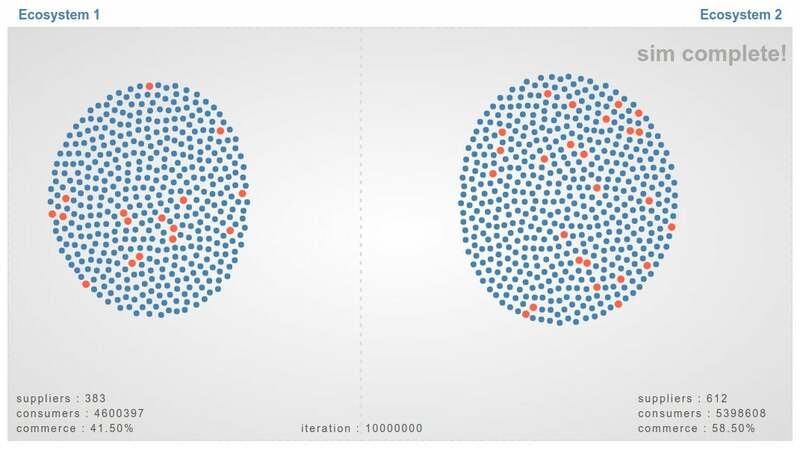 Now Ecosystem 1 is over 17 times bigger than Ecosystem 2, which has only 5.5% of the market represented between the two ecosystems. This shows the potential difficulty of becoming a gravitational platform. Such a platform can attract others and encourage ecosystems to organically grow around it—but that’s typically only true if a comparable platform hasn’t already asserted itself. If you are late to building a platform ecosystem, it does not pay to mimic the strategies of existing platforms and ecosystems, as the previous simulation indicates. However, if you try a different strategy, you may have better luck improving your market position. One example is to target suppliers with incentives. 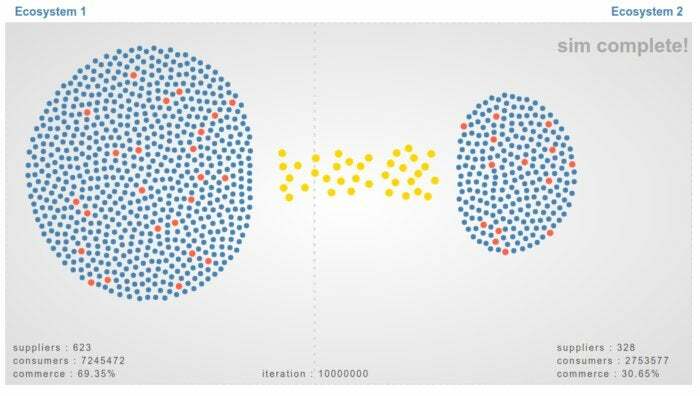 To simulate this, let’s add a supplier bias to the simulation for Ecosystem 2 while continuing to delay its start for 100,000 iterations. That is, even though Ecosystem 2 continues to be “late,” it now employs different tactics than Ecosystem 1. We model this by taking a fraction S of suppliers who would have gone to Ecosystem 1, and moving them to Ecosystem 2. That changes the ratio for suppliers to be: [#consumers(1)*(1-S):*#consumers(2) + S*#consumers(1)]. Here’s the result of the simulation when S = 0.3. Ecosystem 2 has now gone from 5.5% of the market to 58.5%, all by employing a different strategy of attracting more suppliers. Steve Ballmer made this phrase famous by dancing in front of a large developer audience. Theatrics aside, developers are today’s kingmakers, the people who translate a business’s raw digital materials into the apps and services that generate value. In the context of ecosystems, developers can play a very significant role. They are the connective tissue that can translate demand from one ecosystem into supply for another. How? Developers write apps that leverage the supply of one ecosystem. This supply takes the form of application programming interfaces (APIs). These are the mechanisms that let developers utilize a database, service, or function. Developers often combine multiple APIs to create new apps. These apps are then used by consumers within a different ecosystem, translating into demand. For example, Google Maps operates within numerous developer ecosystems, acting as a supplier whose APIs those developers use to create digital products. 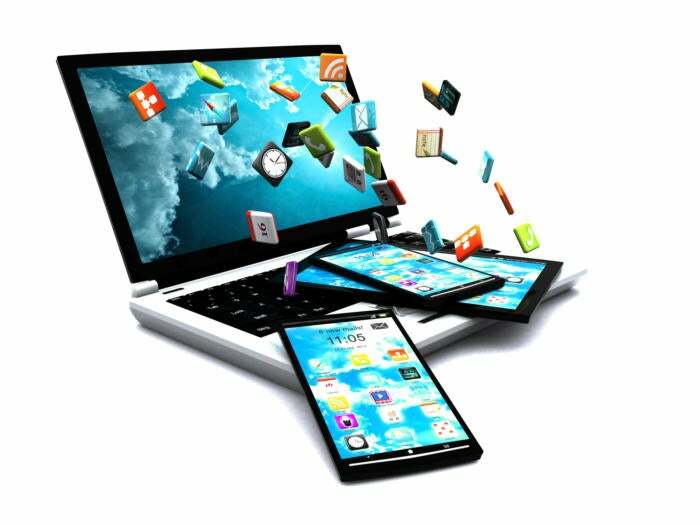 Those products then translate into demand as consumers adopt them in separate ecosystems such as iOS and Android. 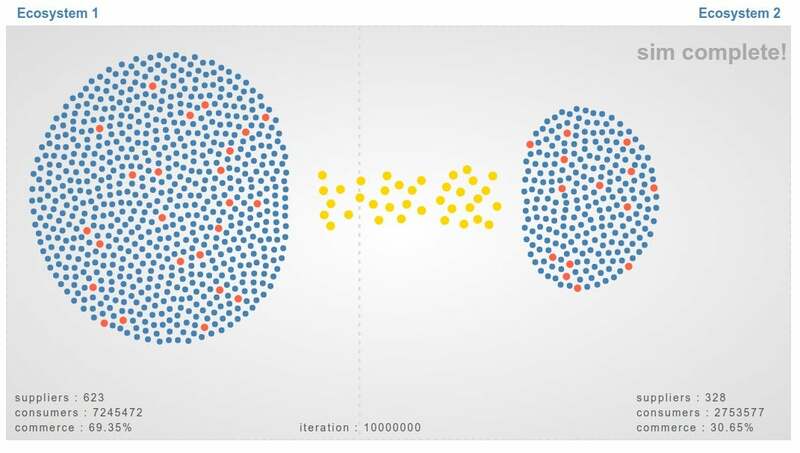 To simulate this idea, we add a third type of node—developers (yellow)—that translates demand from Ecosystems 1 to supply from Ecosystems 2, and vice versa. As a result, the supplier ratio changes to: [#consumers(1):#consumers(2) + D*#consumers(1)] where D is the influence that developers have on bringing demand from Ecosystems 1 to Ecosystem 2 (in effect, increasing the number of virtual consumers in Ecosystem 2 by some fraction of real consumers in Ecosystems 1). Also, the consumer ratio changes to [#suppliers(1) + D*#suppliers(2):suppliers(2)]. Voila! Ecosystem 2 has now gone from 5.5% of the market to 30.65% of the market. As our simulations (and real-world evidence) suggests, if you want to benefit from ecosystems, don’t be late to your market, and if you are, don’t mimic competitors. Instead, use alternate strategies to increase ecosystem participation and engage developers. Nothing is ever a guarantee in today’s marketplace, but if you follow these rules, your chances may increase significantly. The key is to leverage software to create new relationships between suppliers and consumers, not to necessarily become the next giant platform on the scale of Facebook or Android. Being a giant platform is certainly one (expensive and difficult) path to ecosystem success—but remember, companies can also succeed (often faster, more cheaply, and more easily) by connecting their apps and APIs to ecosystems that already exist.